Side note: As stated in the post itself, this review has been slightly modified and my original rating changed. The last half of the book merited a 5 Star rating... but the first half of the book definitely didn't. Which is why this book only gets a 4 Star rating--originally, it was hovering on a 'meh' of a 3 Star rating. So, win-win, I guess. When I finished reading this book for the first time, I was actually a little blinded by fangirl hype and gave it a half a star more for the rating and then proceeded to over-hype myself for the rest of the series. I recently finished listening to the audio book in anticipation of my plans to finish reading the rest of the trilogy... and I've found my experience not all that different than previous, except that I know for certain that, while this book was written very well, and events were quite awesome, it just doesn't appeal to me as much as it did the first time. Nonetheless.... It's a good book. And so I modified my rating and my previous review slightly. The beginning kind of caught me inattentive, which brought upon the lower rating which almost bounced back save for certain things. I hadn't quite expressed much of an opinion on this book previously (because it was very late in my night and I was very exhausted after crunching the last half of the book--or so my previous opinions indicate). But I DO know that after I finally got past what seemed like a slow start to the story, I dove right into the rest of it with this thought: "I physically NEED to finish this book... right now!" Which is always a good thing in terms of how much I ended up loving the story and progression and most importantly the characters both main and supporting. Because a lot of the slow start may have been my own fault, just being unable to focus for reasons other than because of the way the book was written, I wanted really badly to give it a full out five star rating. 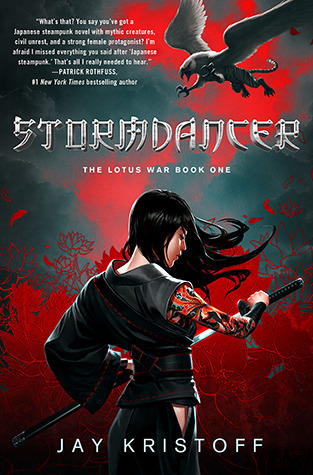 Stormdancer is an excellent book: written well, progressed magnificently, awesome characters created with a nicely planned dystopian society of Japanese steampunk fantasy glory, and etc.... Unfortunately, before I finally DID get hooked into the story with its kickass heroine, crazy-awesome adventure, and selectively random humor that really DID make me giggle aloud several times... well, I still have to point out that the beginning somehow had a lot of awkwardness in the way it was narrated. True, I grew used to it and didn't care for the awkward dialogue and narration, but it still bugged me enough to start the book once the first time, set it aside because I wasn't getting into it, then try to start it up again several months later, and then being unable to get into it once again until the adventure with the thunder tiger hunt officially began. This was actually a little similar to my recent audio book listening experience as well. The only difference is that I can passively listen to Stormdancer without really paying attention to anything that got awkward and dragged out, just to get past that first half of the story. Anyway, aside from the above, I have little to complain about for Stormdancer. I know there's a large fanbase out there of readers who love this book to smithereens and any rating less than a five could be called blasphemous. But to me, maybe this is just a case of "It's not you, it's me," and it was really my fault that I had trouble getting through the first parts; however, after getting over that hurdle, there is no doubt that the story from there on out held my attention unwavering. For now, this is just a brief opinion about my thoughts on the book and I apologize that this small post doesn't offer more about whatever else there may be reason to love this book. This review was originally posted at Goodreads in April 2013.